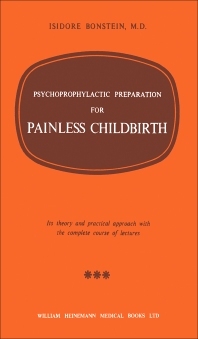 Psychoprophylactic Preparation for Painless Chidlbirth covers the principles and physiological aspects of painless childbirth through psychoprophylactic technique. Painless childbirth by the psychoprophylactic method is the result of a psychical education of the pregnant woman, during the last weeks of pregnancy. This book is composed of 13 chapters, and begins with an introduction to the psycho-physiology of the brain and its role in childbirth, as well as the pain in childbirth. The succeeding chapter outlines the course of eight lectures presented at the psychoprophylactic preparation seminar. These lectures are followed by discussions on material requisites and the directions for labor and delivery. A chapter highlights the very important role of the husband in the psychoprophylactic method. This chapter also outlines eight lectures for husbands. The concluding chapters survey the three methods to evaluate painless childbirth, including the clinical observations of the general behavior and neuro-vegative changes of the parturient, as well as the testimony of the parturient herself. This book will prove useful to obstetrics, neuro-surgeons, gynecologists, and odontologists. Lecture No. 8: Review of the Exercises of Muscular Release, etc.